Another early start and we had a scenic drive along the Rhine – Germany’s third longest river. It starts in the Swiss alps and ends in Rotterdam – 1320 Kms. 12,000 boats use this river. We arrived at the start of a River Cruise and boarded the cruise ship, the “Asbach” in the township of Kampbornhofen on the right shore of the Rhine. It was a beautiful sunny day so we made our way to the upper deck. In the background were the Castle Liebenstein, the highest castle in the Middle Rhine, the Castle Sterrenbery and St Nickolaus church. At Bad Salzig the Church of St Aegidius stood out. Along the way, we passed many medieval castles, towns and towers, old historic castle ruins and small medieval palaces. There were many vineyards growing up the side of the mountains in terraces and is a large wine industry with 87% of the grapes being made into Reisling. The scenery was just breathtaking. We saw the round turret of the 14th century Maus Castle. Further along we saw the magnificent Rheinfels Castle. It is a castle ruin located above the left (west) bank of the Rhine in Sankt Goar, Germany. looming almost on top of the sleepy little town. This 13th Century castle was probably the most popular among visitors to the Rhine Gorge. It was started in 1245 by Count Diether V of Katzenelnbogen. 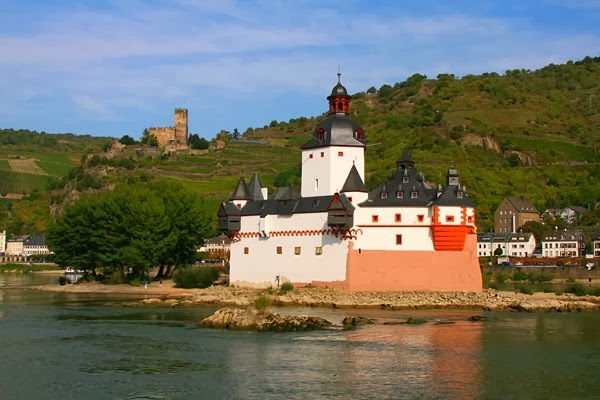 After expansions, it was the largest fortress in the Middle Rhein Valley between Koblenz and Mainz. Wayne, Brenda, Lou and on the right Gay, Alyssa and Wayne – fabulous tour companions – a big thankyou !! Meanwhile across the river, privately held Burg Katz (Katz Castle) continued its dominance above the town of Sankt Goarhausen. Originally built in the 14th Century, the current castle is mostly a 19th Century reconstruction after its destruction at the hands of Napoleon. This would be another intriguing castle to visit, except it’s not open to tourists. Next of note was the Loreley Rock. The Loreley is a rock on the eastern bank of the Rhine near St. Goarshausen, Germany, which soars some 120 metres above the waterline. It marks the narrowest part of the river between Switzerland and the North Sea, and is the most famous feature of the Rhine Gorge, a 65 km section of the river between Koblenz and Bingen that was added to the UNESCO World Heritage Sites in June 2002. A very strong current and rocks below the waterline have caused many boat accidents there. The Rhine is at this place 25 meters deep and 113 meter wide. Today the ships on the Rhine still help themselves with light signals to warn the oncoming traffic. The Loreley is a remarkable high rock, made of schist. The rock lies impressively at a very narrow part of the rhinevalley at St. Goar, Rhineland and Pfalz, at the Taunus mountains. There are several legends about the Loreley Rock. One is that Loreley was sitting on the cliff above the Rhine and combing her golden hair and singing and this attracted many seamen and unwittingly distracted them with her beauty and song, causing them to crash on the rocks. Nobody paid attention to the dangerous rock in the water. So many boats were destroyed and the swirl (which was actually up to 27 meters deep), grabbed them. But did she really sing her song upon her rock or is she just a legend? There is another story of an enchanting female associated with the rock. In a poem, the beautiful Loreley betrayed by her sweetheart, is accused of bewitching men and causing their death. Rather than sentence her to death, the bishop consigns her to a nunnery. On the way thereto, accompanied by three knights, she comes to the Loreley rock. She asks permission to climb it and view the Rhine once again. She does so and thinking that she sees her love in the Rhine, falls to her death; the rock still retained an echo of her name afterwards. So, one does not know the true story but the Loreley Rock is certainly an imposing site. Our boat turned around not far after the Loreley Rock and we headed towards the township of Oberwesel. Oberwesel, another attractive town with some remarkably preserved fortifications and towers, most dating from the 14th Century and castles atop treacherous cliffs where the nobles rules and fortified towns along the waters where peasants defending their territory against raids launched from the boats. Sitting right above the town was the former 14th century imperial Castle of Schonburg, one of several castles along the Middle Rhine serving as hotels. Schönburg castle remained in ruins for 200 years until it was acquired by the German-American Rhinelander family who bought the castle from the town of Oberwesel in the late 19th century, and restored it. The town council of Oberwesel acquired the castle back from the Rhinelander family in 1950. Since 1957 the Hüttl family have been living at the castle on a long-term lease; they operate a successful hotel and restaurant there. Also we saw the red Gothic Church of Our Lady. We joined our coach and followed the Rhine and headed towards the township of Kaub. We saw Pfalzgrafenstein Castle, a toll castle on the Falkenau island, otherwise known as Pfalz Island in the Rhine river near Kaub, Germany. Known as “the Pfalz,” this former stronghold is famous for its picturesque and unique setting. The keep of this island castle, a pentagonal tower with its point upstream, was erected 1326 to 1327 by King Ludwig the Bavarian. Around the tower, a defensive hexagonal wall was built between 1338 to 1340. In 1477 Pfalzgrafenstein was passed as deposit to the Count of Katzenelnbogen. Later additions were made in 1607 and 1755, consisting of corner turrets, the gun bastion pointing upstream, and the characteristic baroque tower cap. The castle functioned as a toll-collecting station that was not to be ignored. It worked in concert with Gutenfels Castle and the fortified town of Kaub on the right side of the river. Due to a dangerous cataract on the river’s left, about a kilometer upstream, every vessel would have to use the fairway nearer to the right bank, thus floating downstream between the mighty fortress on the vessel’s left and the town and castle on its right. A chain across the river drawn between those to fortifications forced ships to submit, and uncooperative traders could be kept in the dungeon until a ransom was delivered. The dungeon was a wooden float in the well. We came to the township of Bacherach and saw the Stahlech Castle. It’s exact date of origin is not known, but it has been proved that the castle was already occupied since the year 1095. For many years, the Castle was a ruin and on 23 June 1926 a youth hostel was built. Starting at the end of 1965 until 20 May 1967, the youth hostel was further constructed on the Castle and is now a very well known youth hostel. 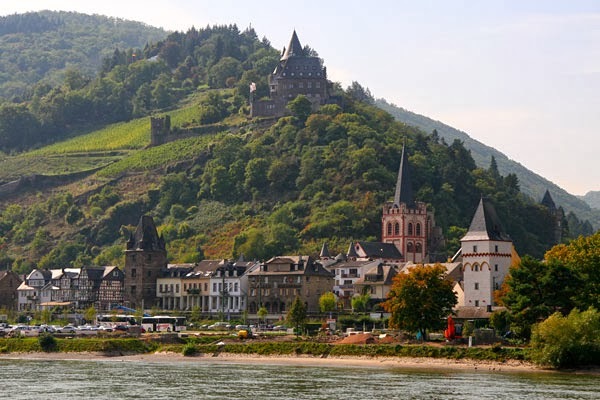 We still followed the Rhine for many miles – many vineyards were along the way. We passed through the townships of Assmannhausen – noted for its lithium spring, spa and a kurhaus (German for “spa house” or “health resort”) and is famed for its red wine made from Pinot noir which resembles red Burgundy wine. Was interested to hear that the heritage-listed former winery Assmanshausen Winery in Queensland, Australia, was named after this region. The next village we came to was Bingen. The Mouse Tower (Mäuseturm) is a stone tower on a small island in the Rhine, outside Bingen, Germany. The Romans were the first to build a structure on this site. It fell and had to be rebuilt many times. Hatto II, the Archbishop of Mainz, restored the tower in 968. Here wewere told a story – The story of how it came to be called the “Mouse Tower” comes from a folk tale. According to this popular, but unsubstantiated, legend Hatto II was a cruel ruler who oppressed and exploited the peasants in his domain. He used the tower as a platform for crossbowmen and demanded tribute from passing ships, firing on their crews if they did not comply. During a famine in 974 the poor had run out of food, but Hatto, having all the grain stored up in his barns, sold it at such high prices that most could not afford it. The peasants became angry and were planning to rebel, so Hatto devised a cruel trick. He promised to feed the hungry people and told them to go to an empty barn and wait for him to come with food. The peasants were overjoyed and praised Hatto heartily. They made their way to the barn to await his coming. When he arrived with his servants, he ordered the barn’s doors shut and locked, then set the barn on fire and burned the peasants to death, derisively commenting on their death cries with the words “Hear the mice squeak!” When Hatto returned to his castle, he was immediately besieged by an army of mice. He fled the swarm and took a boat across the river to his tower, hoping that the mice could not swim. The mice followed, pouring into the river in their thousands. Many drowned, but even more reached the island, where they ate through the tower’s doors and crawled up to the top floor, where they found Hatto and ate him alive. For they were sent to punish him! At about 11.30 were back on the coach and we left the Rhine and travelled south wards along the auto barn- saw more caravans and trucks for many kilometers. There were very long queues on the other side of the road. At 2.00 we had a short comfort stop and then continued on until another stop at 5.20 and this would be our last stop in Germany. Had 132 Kms from 6.00 to travel to Innsbruck. The Bavarian Alps were now coming into view – rolling green hills, mountains behind lakes. Little villages dotted all along in between smaller hills. At about 6.25 we crossed the border into Austria. Some of the well known names to come out of Austria were Verdi and Strauss, Mozart composed the National anthem, the eidelweiss flower and in Salzburg, the Sound of Music, the Vienna Schnitzel, goulash, croissant just to mention some. Marie Antoinette was born in Vienna on 2 November 1755. We had a photo stop at Biberweir, Tyrol – beautiful. Onwards still to our accommodation at the Hotel Rumerhof. Once more, after dinner socialised before going to bed in readiness for another early start. What a fabulous day – first the cruise on the Rhine – saw so many beautiful castles and countryside and then the magical scenery of the mountains and more mountains, the little huts all along the way and the tunnels. Austria is an amazing country from what I have seen.